B2B Marketing Fail - Your target persona's retiring & you're stuck! Many senior managers at B2B manufacturing companies have matured with the business or at least in an industry. There's an implicit connection between senior engineers on both the vendor and buyer sides, and there's a comfortable, natural rapport that often exists among senior, experienced engineering and management folks on both sides of typical B2B transactions. The upside is that it's pretty easy to connect, quickly assess competence and credibility, and dive into project details and operational requirements. It's comfortable - and traditional sales and marketing methods continue to work in this peer to peer, traditional world. But...if the Department of Labor Statistics is correct, your world as you know it is about to change. Over several years HALF of the engineering workforce will retire. And when was the last time you chatted....much less bonded with a millennial engineer? You probably don't recall, because they probably aren't using the phone or introductory meetings to meet folks like you. They have different habits. Now you don't need to feel comfortable with their approach. But if you expect your business to thrive over the next decade you'd certainly better develop a marketing and sales approach with which they are comfortable and which effectively helps them buy according to their buying preferences and processes. But typically research in the B2B world looks at buyers monolithically rather than distinguishing between demographic groups. And that's an important perspective because as broadly used as the internet is for B2B purchasing, the difference in use behaviors between younger (< 35yo) and older (>=35yo) engineers is striking. 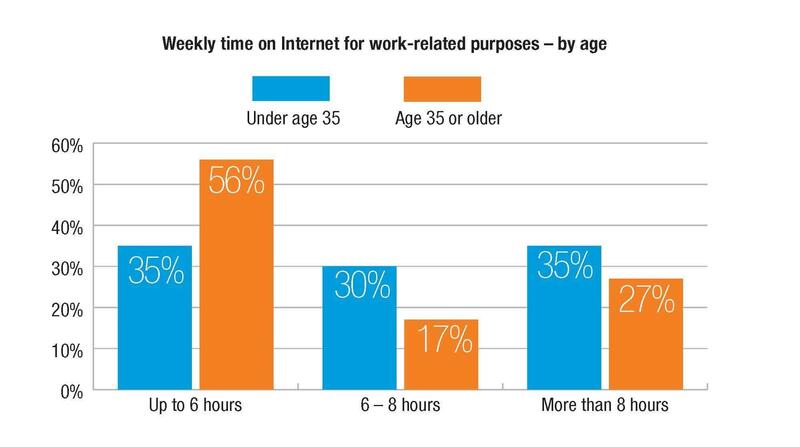 For instance, among engineers spending more than 6 hours/week on the internet, the younger group issubstantially more prevalent. And among the activities which they undertake online, IHS's research finds "growing importance of general search engines, industry-specific search engines and webinars among the under 35 group, whereas online catalogs and supplier websites grew in importance among those over 35." So what's an over committed B2B manufacturing company exec to do? With inadequate resources to do everything, what's most important? Don't misunderstand the relative importance of other sources (e.g. 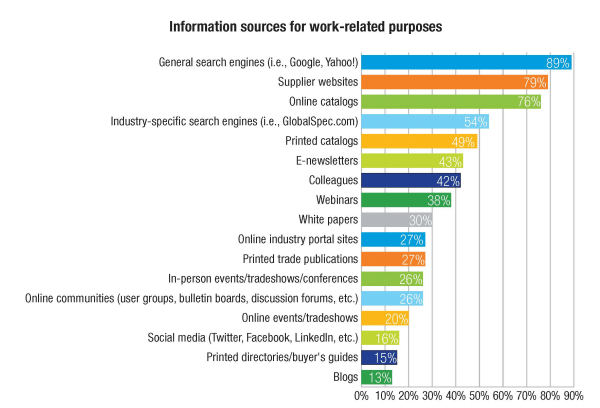 webinars, online communities, whitepapers & blogs) - 89% are relying on general internet search. That means that to even participate in the early virtual sales process you must be found by that internet search. And therein lies the compound power of valuable content like a robust blog - it's critical first to "get found" and then once found it's invaluable in building virtual rapport based on credibility and expertise. Traditional B2B websites that are well optimized around product specific specs will generate some traffic. But they will only serve transactional purposes. To build relationships with engineers predicated on thought leadership and professional credentials requires an ongoing virtual dialog. That requires a site built around industry challenges and solutions, with great content in various formats optimized for target personas. Simply focusing on your products and specs will miss most of your business development opportunity. Even among older engineers and industrial buyers digital media is effective - and poor digital marketing will negatively impact your sales. But among upcoming generations of younger engineers it's critical to not only have robust digital marketing - but to have awesome marketing. 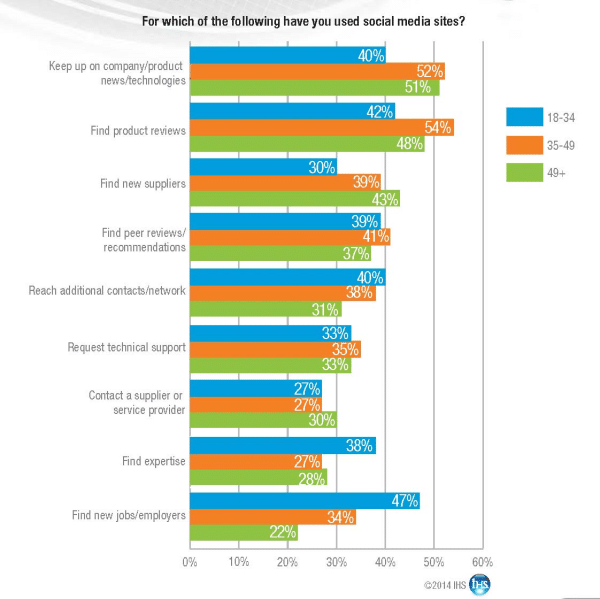 Younger engineers that are digitally fluent will often perceive stilted and poorly presented digital marketing as a manifestation of a poorly positioned supplier. Don't let your hesitance to embrace internet marketing give a faulty impression to potentially profitable buyers!